Thrown together by fate, three women will discover what they're really made of: laughter, tears, and all. Thrown together by fate and geography, and bound by the strongest of friendships, these three women will discover what they're really made of: laughter, tears, love and all." "Susan Mallery gives us a candid, honest look into the turmoil of family life when tragedies and personal crisis' occur. Welcome back to Blackberry Island. So nice to meet these newest additions to this lovely tourist town and visit with some old friends. Mallery never disappoints her readers and THREE SISTERS is no exception. It's a winner and should be on everyone's short list of must reads." Top 13 New Books of 2013! The story of three women who have bought the famed Three Sisters Queen Anne Houses on Blackberry Island, a place where they find friendship, heartbreak, romance, laughter and tears. 5 out of 5 hearts! "I was pulled in from the very first word of the story and was captivated until the very end! The characters are flawed but are very easy to relate to. The romance is tender and sweet. I found myself cheering on each of the couples as they worked toward their happily ever after. I highly recommend this highly engrossing read to those who are looking for a book about love and friendship, grief and loss, family ties, and small town life!" March 2013: One of the Best Books of the Month! "Can their newly formed friendship help these women deal with family tragedy, marital difficulties, and their quest for true love? A romantic charmer." "Three Sisters is a 5 stars read, must buy and a definite Good Choice for Reading." "I always enjoy Susan Mallery’s women's fiction novels... In each woman’s life is a man who is both part of her brokenness and essential to her healing... It’s a process, but a process with a happy ending in sight." "This is real life encompassed in one single book. How Susan Mallery got through the writing of this book with all the emotions she poured into it I will never know but I am glad she did. I am a better person for “knowing” these three women." "...a touching and heartfelt novel that is deeply compelling and full of emotion... Three Sisters is a captivating novel about friendship, facing fears, overcoming tragedy and finding the courage to love again. This installment of the Blackberry Island series can be read as a standalone story, but you won’t want to miss a single book in this delightfully heartwarming series." "Get out your tissues and prepare to be seated until you finish this book!" "Did you ever just finish a book, sigh deeply, and think: GEE I REALLY NEEDED THAT? This is exactly how I felt with Susan Mallery’s latest, Three Sisters... friendship, hot moments, and glimpse at adults who really have to make the effort to move forward in their lives to find happiness. As always, a Mallery read is all in good fun!" 5 Ravens! "Susan Mallery has penned an emotional journey that is rough, but realistic... Every woman who reads Three Sisters will be able to identify with at least one of these characters, if not all." "I’m a newcomer to Susan Mallery’s books but that just gives me more of her backlist to look forward to reading... [In Three Sisters], there was humor, heart, and real life. I believed these women could be living on an island, making margaritas, and encouraging each other. None of them pretend to have all the answers. Or any answers. But that’s what made them likeable and made me root for them. I loved this one." "This emotional read will have you laughing, crying, and even get you angry. However, such is life. It's whether or not you come out of it a stronger person or shrink within yourself that ultimately decides your fate. Well-written characters and a beauty of a location, this is a great read to treat yourself to!" 5 out of 5 bookmarks! "Three Sisters isn’t necessarily a love story. All the characters are trying to find love, or the love they used to have, but this book is more about growth. It’s about family, finding yourself, healing and moving forward from troubled times... It’s a book you just can’t put down... reminds me of Kristin Hannah’s books." 5 Stars "When [the three heroines] combine their strengths, they achieve small miracles, with each of them somehow finding exactly what they most needed. Sharing, giving, and taking: such is the nature of women. Three Sisters is a very enjoyable look at how women work little miracles nearly every day." 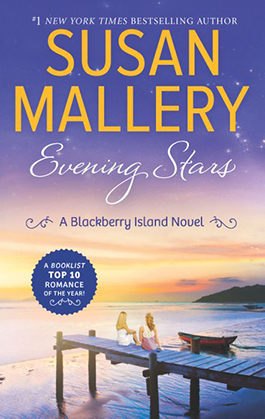 "In her second “Blackberry Island” novel (after Barefoot Season), Mallery has again created an engrossing tale of emotional growth and the healing power of friendship as these three “sisters” meet life’s challenges." 5 Stars "Three different women from three different walks of life are brought together into a sisterhood in this very compelling book... Susan Mallery has a way of drawing her readers in and keeping them captivated in the character of her books... I laughed, cried and was very happy with the way the the book ended." Solid 5/5 stars! "Mallery has given readers a captivating tale of romance with her own unique twist that will have you hooked to the very last page." "I loved this book!! Having moved into a new community within the last year, I know how important it is to form friendships with your neighbors... This was an easy read and very enjoyable. It made me laugh and cry. A great read!! The characters all came to life for me and I could relate to each of them in one way or another." 5 Stars! "Susan Mallery has penned an emotional journey that is rough, but realistic. Andi, Deanna, and Boston leap off the pages as real women with serious problems who are simply trying to survive and make things better in their lives... I’m amazed at the depth of this story as each character is forced to deal with some serious and difficult situations that left me raw and emotional just reading about them." "Great book... If you are looking for a book to read that tugs at the emotional strings but shows how strong woman can be with their emotions, and changing, and just going with the flow, I highly recommend that you pick up Three Sisters." "Mallery writes immensely relatable characters and makes you became completely engrossed in their stories and lives. I recommend this book to anyone who enjoys reading about female friendships. With two hits for me in a row, Mallery is fast becoming one of my favorite authors!" "Susan Mallery is an author who never disappoints... Susan Mallery never fails to pull a plethora of emotions with her stories, and this book was no exception. I laughed; I cried; I got mad. I LOVED IT!" "I've read a lot of Susan Mallery's other books and always know I am in for a treat when I pick up her books. She seems to write from the heart and always manages to tug at my heartstrings... I love how Susan Mallery creates such real, life-like characters with problems that you can easily relate to." "I loved this book! It has so many elements that touch my heart and funny bone... Each of the women in the three houses goes through their own different crises. But through it all they learn, grow, and laugh. By the end of the book, the Three Sisters describes the women as much as it describes their homes." "Susan Mallery has a gift for bringing well-written fiction to her readers that feature stories that will resonate and linger with them for a long time afterwards. Three Sisters is such a story." "First off, I am brand new to Susan Mallery and after reading Three Sisters, I'll definitely be diving into her other works. Three Sisters has three point of views from three women going through a phase in their lives where they are tested and pushed to their emotional brinks. I absolutely loved this book." "I lose all sense of time when I read any of [Susan Mallery's] stories, and I think that’s genius. I was able to get lost in the details of the characters, the plot, and everything in between... Mallery’s Three Sisters is a perfect weekend read." "Three Sisters really is a book that has it all. Amazing characters, beautiful setting, and touching stories…what more could you ask for? 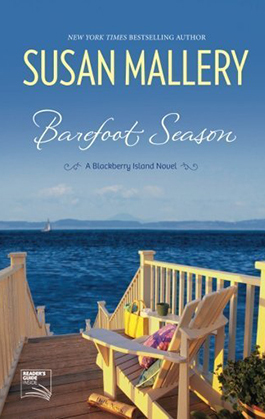 I look forward to more books from Susan Mallery set in this wonderful island." 5 stars! 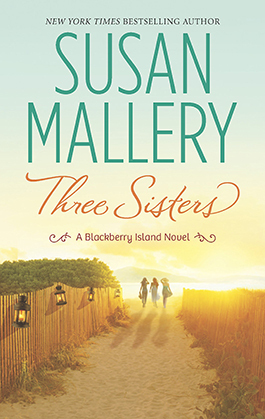 "In Three Sisters, Susan Mallery once again brings readers a story packed full of emotion, delivered in her unforgettable style of smart dialogue, compelling characters, and heartfelt narrative... For readers looking for a book of depth and emotion, Susan Mallery’s Three Sisters is not to be missed." "I laughed, I cried, I loved it! ... Recommended: without hesitation." "I was able to relate to all three of the women in the book in one way or another. I looked forward to getting back into the story each time I was able to and finding out how each of their stories unfolded…and of course, how they came together... I will definitely look for other books by this author." "I really enjoyed this second book in the Blackberry Island Series. While reading it, I experienced heartbreak, joy, anxiety and grief... If you haven't read the first in the series, Barefoot Season,don't worry, this can really be read as a stand alone novel. But I do highly recommend the series as a whole." "Chick lit warning: I cried in parts of this story but that just makes me love these kinds of books more... a great little book for those of us addicted to chick lit." Being left at the altar was not for sissies. Aside from the humiliation and hurt, there were actual logistics to worry about. Odds were if a guy was willing to leave you standing alone in front of three hundred of your closest friends and relatives, not to mention both your mothers, he wasn't going to sweat the little stuff like returning the gifts and paying the caterer. Which explained why three months after going through that exact experience, Andi Gordon was putting her life savings into a house she'd only seen twice, in a town she'd only visited for seventy-two hours. Go big or go home. Andi had decided to do both. After signing the final paperwork and picking up the keys, she drove up the hill to the highest point on Blackberry Island and stared at the house she'd just bought. It was known as one of the "Three Sisters." Three beautiful, Queen Anne style homes built around the turn of the last century. According to the realtor, the house on the left had been restored perfectly. The ice cream colors reflected the style and fashion of the year it was built. Even the garden was more traditionally English than casual Pacific Northwest. A girl's bike leaned against the porch, looking modern and out of place. The house on the right was also restored, but with less period detail. The slate gray trim framed stained-glass windows and there was a sculpture of a bird taking flight in the front yard. The house in the middle still had a For Sale sign planted in the unkempt grass. While alike in style and size, the house she'd bought had little else in common with its neighbors. From the roof, with missing shingles, to the peeling paint and broken-out windows, the house was a testament to neglect and indifference. If the building hadn't been historic, it would have been torn down years ago. Andi had seen the seller's disclosure—listing all the problems with the house. It was pages long, listing every from major issues with an electrical upgrade done twenty years before to lousy and non-functioning plumbing. The building inspector Andi had hired to look over the place had given up halfway through and returned her money. Then her agent had tried to show her a lovely condo overlooking the marina. Andi had refused. She'd known the second she'd seen the old place that it was everything she'd been looking for. The house had once been full of promise. Time and circumstance had reduced it to its present condition—unloved and abandoned. She didn't need a degree in psychology to understand she saw herself in the house. She was very clear on the pitfalls of believing if she fixed the house, she would also be fixing herself. But knowing and doing, or in this case, not doing, weren't the same thing. Her head might be busy pointing out this was a mistake of mammoth proportions, but her heart had already fallen in love. Given her recent, very public broken engagement, falling for a house seemed a whole lot safer than falling for a man. After all, if the house abandoned her at the altar, she could simply burn it down. Now parked in front of the three story disaster, she smiled. "I'm here," she whispered, offering the promise to both herself and the house. "I'll make you whole again." The past three months had been a nightmare of logistics and recriminations. Buying one of the "Three Sisters" had given her something else to think about. E-mailing documents for her loan was a lot more fun that explaining to her second cousin that yes, after dating for over ten years, Matt really had left her at the altar. Yes, he had actually said their decision to marry had seemed so sudden and that he'd needed more time. And yes, he had run off to Las Vegas two weeks later, marrying his receptionist. She refused to think about the conversations she'd had on the subject with her mother. But knowing that she would soon be leaving Seattle for Blackberry Island had kept her going. She'd focused on escape and the freedom that would follow. Then she'd packed up her place in the city and had headed north. Andi squeezed the keys her real estate agent had handed her, feeling the metal dig into her skin. The pain brought her back to the present, to this moment where there were only possibilities. She got out of her car and stared at the broken and abandoned house. But instead of boarded windows and a sagging porch, she saw what it would be. New. Shiny. A home people would admire. Not a cast-off. Because when the house was restored, Andi could call her mother and talk about that. It would be a far better conversation than listening to the woman list everything Andi had messed up in her life. Like not allowing Matt to guide her into changing and how she'd foolishly let a good man get away. Andi turned to admire the view. On a clear day the water of the Puget Sound sparkled. Granted, clear days were relatively rare in this part of the country, but Andi was okay with that. She liked the rain. The gray, drizzly sky, the squish of her boots against the sidewalk. All that gloom made her appreciate the sunny days. She turned west, looking out over the Sound. The houses had a perfect view. They'd originally been built by sea captains, oriented to watch the ships sail in. In the late 1800s, seafaring had still been important to the area, not yet overtaken by the lure of logging. This was right, she thought happily. She belonged here. Or she would, with time. If the renovations started to get to her, she would simply look at her view. The dance of the water, the peninsula beyond, were far different from the high-rises of downtown Seattle. The city might only be a couple of hours away by car, but it was another planet when compared to the small town that was Blackberry Island. "Hello! Are you the one who bought the house?" Andi turned and saw a woman walking toward her. She was of average height, with long dark red hair that flowed halfway down her back. She wore jeans and clogs, with an ivory cable-knit sweater that just grazed her hips. Her face was more interesting than pretty, Andi thought as she approached. High cheekbones and large green eyes. Her pale skin was probably a result of both genetics and a complete lack of sun exposure since the previous September. The woman smiled. "Finally. That poor place. It's been so lonely. Oh, I'm Boston. Boston King." She pointed to the house with the sculpture of the bird on the lawn. "I live there." They shook hands. Weak sunlight broke through the clouds and highlighted what looked like a dark purple streak in Boston's hair. Andi fingered her own dark hair and wondered if she should do something as dramatic. The most she'd ever managed was a trim. "Any relation to Zeke King?" Andi asked. "He's the contractor I've been e-mailing about the house." Boston's expression brightened. "My husband. He and his brother own a local firm here on the island. He'd mentioned he'd been in touch with the new owner." She tilted her head. "But he didn't say anything about you and I'm dying to know the details. Can you spare a few minutes? I just put on a fresh pot of coffee." Andi thought about the cleaning supplies in the back of her SUV. With the moving van arriving in the morning, she had plenty to do to get the place ready. But there were only three houses on the small cul de sac and getting to know one of her neighbors appealed. Boston led the way across the ragged grass to her own yard, then up the steps to the front door. Andi noticed the boards that made up the porch floor had been painted dark blue and there were stars and planets scattered around. The front door was dark wood with stained glass panels. The eclectic mix of traditional and whimsy continued in the foyer. A Shaker-style bench stood by a coat rack. On the wall was a mirror framed by silver squirrels and birds. The living room to the left had comfortable sofas and chairs but there was a huge painting of a naked fairy over the fireplace. Boston led the way down a narrow hallway, painted blood red and into a bright, open kitchen. There were cobalt blue painted cabinets, sleek, stainless appliances and a gray and blue marble countertop. The smell of coffee mingled with fragrant cinnamon and apples. She took the offered seat. Boston opened the oven and removed a cookie sheet with two scones on it. They were large and slightly browned. The apple butter was in a glass jar. Boston put the scones on a plate and passed one over, then poured coffee. She collected the flavored creamer from the refrigerator. Andi glanced around. There was a big window over the sink and another in the corner eating area. A large pantry took up most of one wall. While she could see the original molding and beadboard by the back door, the rest of the kitchen had been updated. "I love the space," Andi said. "I'm not sure my kitchen has seen so much as a coat of paint in the last sixty years." Boston collected two knives and handed her one, then cut open her scone and smoothed on apple butter. As she worked, several silver charm bracelets clinked together. "There was an open house about a year ago. Zeke and I went through. The kitchen was very 1950." "I don't mind the retro look," Andi admitted. "But nothing works. I have a thing about turning on a faucet and having hot water come out. And I'd like a refrigerator that keeps food cold." Boston grinned. "So you're a demanding sort." "I know Zeke's been drawing up plans. I haven't seen all of them, but he and his brother do beautiful work." Andi looked at her kitchen. "Did he update your house?" "About six years ago." Boston picked up her coffee. "Where are you moving from?" The island was small enough that Andi wasn't surprised Boston assumed she was from somewhere else. "Seattle." "Big city, huh? This is going to be a change." "I'm ready for a change." "Do you have a family?" Andi knew she didn't mean parents and siblings. "No." Boston's expression registered surprise. "That's a big house." "I'm a doctor. A pediatrician. I want to use the main level for my practice and live upstairs." Boston's shoulders seemed to tighten. "Oh, that's clever. You'll avoid the hassle of commuting." She glanced out the window over the sink toward Andi's house. "There's plenty of space for parking and I can see how the conversion wouldn't be difficult." "The biggest modification will be moving the kitchen upstairs. I was going to have to gut it anyway, though, so moving it upstairs isn't adding a lot to the bill." She reached for her scone. "How long have you lived on the island?" "I grew up here," Boston told her. "In this house, actually. I've never lived anywhere else. When Zeke and I started dating, I warned him I came with about three thousand square feet of baggage." Her smile faded a little. "He said he liked that about me." Andi chewed the vanilla flavored scone, enjoying the tart apple and cinnamon spread, then swallowed. "Do you work outside the home?" Boston shook her head. "I'm an artist. Mostly textiles, although lately..." Her voice trailed off and something dark entered her eyes. "I sometimes do portraits. I'm responsible for most of the strange things you see around here." "Do you? Deanna hates it." Boston wrinkled her nose. "She would never say anything, of course, but I hear her sighing every time she steps on it." "Isn't it? You should see the inside. I'm sure she'll invite you over. The front rooms are furnished true to the time period. The historical societies love her." Boston glanced out the window again. "She has five daughters. Oh, customers for you." She frowned. "Or is clients?" Boston nodded. "Right. The girls are very sweet." She shrugged. "And that's the neighborhood. Just the three of us. I'm so happy someone is going to be living in the middle house. It's been empty for years. A vacant house can be sad." Although nothing about Boston's tone had changed, Andi felt a shift in the other woman's energy. Even as she told herself she was being what her mother would call "weird beyond what we consider normal" she couldn't shake the feeling that her neighbor wanted her gone.